Health News Online is a comprehensive online publication — updated regularly — that offers health information, safety tips and other information that can help enhance the health and well being of residents of northwest Oklahoma. A new CT scanner at St. Mary's provides accurate imaging with even greater safety, speed and efficiency. Dry needling comes to St. Mary's. Homer Holden has a standing date on his calendar that gives his heart and soul a lift. 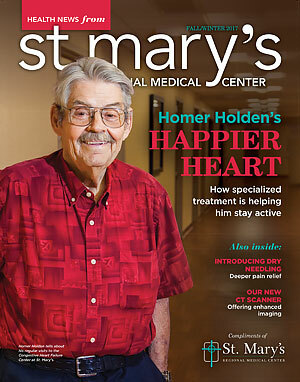 It’s with the Congestive Heart Failure Center at St. Mary’s Regional Medical Center, where he goes for infusion treatments and to spend time with people he enjoys.